It is with a heavy heart that I must inform you that my father, Vic King, passed away peacefully, with his family by his side, on May 7, 2012. Dad was the visionary and creator of the Lake George RV Park which he loved and enjoyed until his last day. A camper himself, he began fulfilling his dream to build a campground in 1966 and worked diligently for over four decades to create what we cherish at the Park today. He was a true pioneer of the RV park industry; creating one of the first parks in the U.S. designed specifically for campers with recreational vehicles. The park opened with over 200 full hookup sites, miles of paved roads and amenities not typically associated with outdoor hospitality resorts. 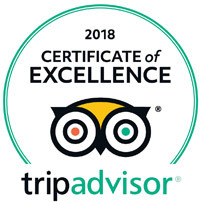 He continued to make improvements every year, including; our indoor pool & recreation building, trolley shuttle service, the French Mountain Playhouse and our on-site RV rental program. The Lake George RV Park has remained a model for the industry for the past forty-six years. Vic’s work remained his passion until his retirement in 2008. He enjoyed seeing our guests return each season with joy and enthusiasm for the beautiful park that he built. Dad had a great sense of humor and enjoyed visiting and sharing funny stories with our guests while he toured through the park making his daily rounds. He had a wonderful work ethic and truly enjoyed running the Park with his family. He impacted the lives of countless families that found peace, comfort and enjoyment under these Adirondack pines at the base of French Mountain. Whether you personally knew my father or not, you can get a great sense of how special this man was by experiencing the magic of the Lake George RV Park. You may think that the Park is his greatest legacy, while it is so much more. My Dad’s most special gifts came from his heart, and he continues to live within everyone who comes to this special park and enjoys themselves here. We can all give thanks for everything my father shared while he was with us. He truly lived his life to the fullest. We will continue to celebrate all that he provided us as we go on with our own lives. 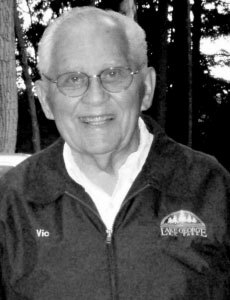 His family continues to serve as the stewards of this special resort, always keeping Vic’s lifetime mission, of keeping the Park a place where families wish to return each year, a primary goal.